The youth camp to create drums from scratch is expected to run for four weeks and will be capped off with a community dance using the newly crafted instruments. 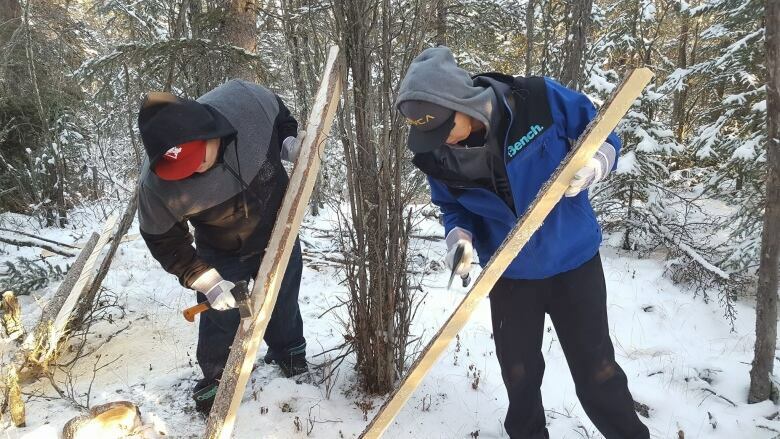 The whir of chainsaws and the scrape, scrape, scrape of hide-tanning knives has lit up a snowy camp just outside of Behchoko, N.W.T., for the past week, as 10 young men learn to build hand drums from scratch. 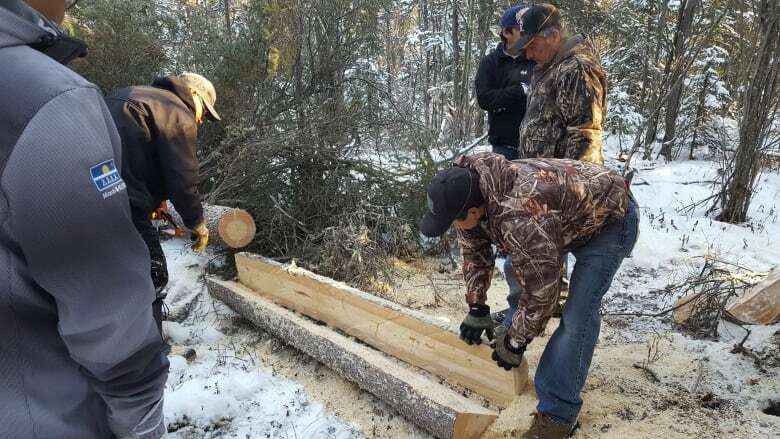 The workshop started last Tuesday, with the group, accompanied by several Tlicho elders, chopping down tall, straight spruce trees and hauling them back to camp, situated in Frank's Channel, between Rae and Edzo. Now trimmed into fine strips, the wood will be bent into loops next week. And the group has been working a number of caribou hides down to a supple skin to be stretched over the frames. 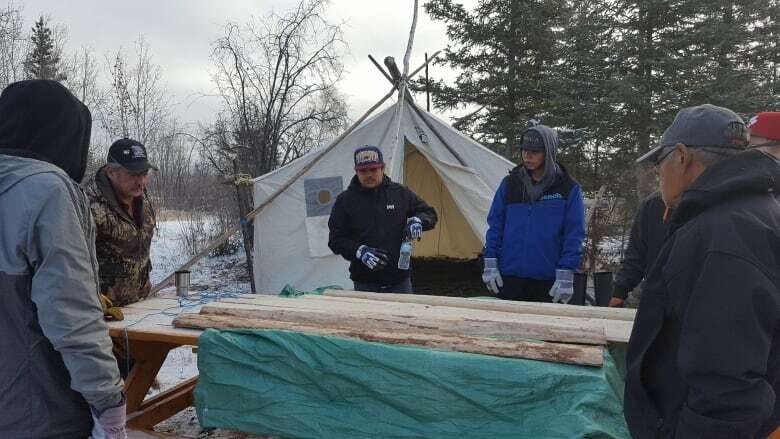 "It's been a fun experience for me learning how to scrape the hides and make the frame from the tree," says Clarence Mackenzie, one of the participants. "It's a really good exercise," he adds with a laugh. The camp is expected to run for four weeks and will be capped off with a community dance using the newly crafted instruments. Janelle Nitsiza, the 23-year-old from Whati, N.W.T., who is organizing the program, dreamed it up last summer while learning to build drums with two elders. "After I lost my grandmother, Louie and Therese [Zoe] kind of brought me in and adopted me in a way, teaching me all these things — and this summer we decided to make about ten drums," says Nitsiza, who was recognized two years ago with a Minister's Culture and Heritage Circle award for her work with cultural programs. "Me and Therese, we scraped the hides and we prepared everything, and Louie did the bending. I was so amazed to see the drum being made and I saw a need for other people to learn it." Nitsiza successfully applied for government funding to get the program off the ground, and she and Therese Zoe both donated the caribou hides that will become the drum skins. Zoe is also helping run the camp — cooking for the young men, offering tips on drum making and passing along stories and wisdom. "I like teaching them, I want them to know our language too. That's the most important thing to know who we are," Zoe says. "And I see the young people really enjoying it. They're happy to be here, they want to learn... I don't hear any complaints, everyone is happy. We all work as a team," she adds. Nitsiza says she hopes the participants will make two drums each — one for themselves, and "one for an elder or for the community, so it can go into the hand games." For Nitsiza, the project is about keeping traditions alive and vibrant: "I see that there's a limited amount of elders that know this amazing trade, and I just felt the need to do something for my region, for my people, to help revitalise the art of drum making." But she also sees entrepreneurial opportunities for the young men who are learning new skills. "I see a lot of youth participating in hand games and drumming together and practicing the songs, but I don't really see drum making. Eventually this could turn into a small business for one of my participants." Along with the hands-on part of the program, Nitsiza is running evening workshops about the value of staying in school or pursuing further education. "Just being strong like two people I guess," she says, citing a well-known Tlicho saying. It's all about "learning something traditional and learning something in the modern way." Remembering Jojo: Dene man loved life, music, bingo and Behchoko, N.W.T.